The First Mercy International Centre Team was commissioned by Mary Waskowiak rsm, Chairperson of Mercy International Association, on behalf of the Sisters of Mercy of the world, during the blessing and opening of the Centre on 23 July, 1994, and entrusted with 'the ministry of caring for Mercy International Centre'. This week the members of the First Team recall for us their precious memories, at times humorous, some deeply moving, all witnessing to providence. Patricia Ryan rsm (Director) writes: My memory would have been a better provider if I had been recalling these events some years ago, however there are certain recollections that do stand out. I was deeply moved when I first arrived at Baggot Street to see the construction workers genuflecting each time that they passed Catherine’s grave. It was also very special to spend quiet time in the room where she died as well as at the grave in the garden where she was buried. The first few days after the opening ceremony were jammed with tours to accommodate a world-wide gathering of sisters and friends who came to the opening ceremony. The team members could soon repeat the script of the film by heart. It was a time of high pressure, in addition to all the tours, we were working out our individual responsibilities. The Sisters on our first team all came from English speaking countries, but there were some confusing foreign wordings at times. One day I walked into the dining room holding an item in my hand and asked “If Ursula asked you to put this on the bench, where would you put it?” I learned that while in the US a bench was something to sit on, in Australia it referred to a counter. I was happy to find the plans for renovation included a room off of the Herbert Street entrance where we could offer the important work of Mercy - feeding the poor, without even having to leave the house. One man who often came to present his requests would always end with an emphatic “NO CHEESE”. The day of installing the large statue of Catherine by the front steps was a very memorable occasion and a large crowd gathered to witness the prominent announcement of what this building was all about. When you think of the many retreats and days of prayer that have been held within these walls, it must make Catherine proud to have begun this venture of Mercy. I consider it a very special blessing in my life to have spent time sitting at the desk in what had been the office of our beloved Foundress and being able to meet so many of her Sisters of Mercy from around the world. 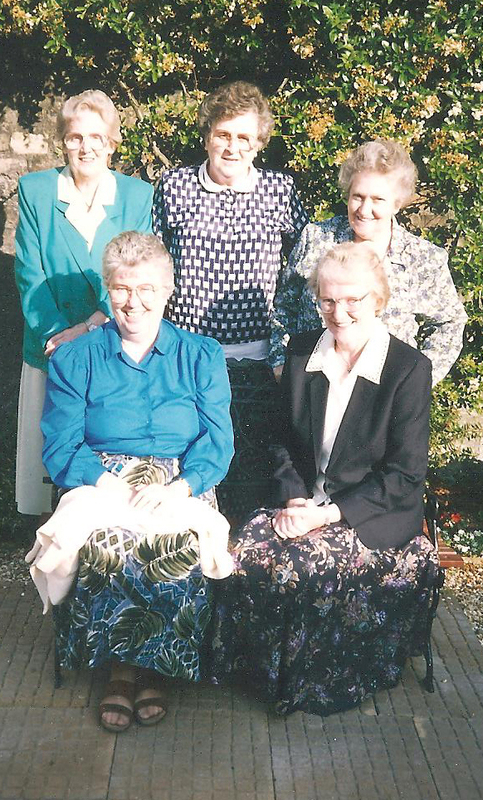 Elizabeth McCaver rsm writes: In 1991 I had accepted the option given to Irish sisters in Auckland, New Zealand to return permanently to Ireland if they so wished with the full support of the generous Congregation in Auckland. I knew before I left Auckland that I was to take position of finance person during the works of transition and restoration at Baggot Street Convent. I was privileged to work on the project with Mary Trainer rsm from the time the Dublin community vacated the house, leaving a small group of sisters who made a warm welcoming community for us. When the contractors moved on site, Mary and I took up residence and work space in the small rooms over the garden. One precious memory of this time is that on Foundation Day, Mary and I prayed together in our little sitting room and used Catherine’s letter where she says “It started with two, Mary Ann Doyle and I”, and we both cried as we remembered the thousands of Sisters around the world now in 1992 in collaboration for this new venture undertaken with prayer for “Providential Guidance”. In a short time the property had become a dangerous building site and it was difficult to keep visitors-Sisters, Associates and Friends of Mercy off the property. The site manager would ring me to come down and speak to them of the danger which was not easy when one knew that for some of them it was a once in a lifetime experience. When the call went out asking for the Sisters who might take on the role of director or team member of the new Mercy International Centre, over one hundred applications were received and after discernment and interviews with Members of the Association the team was chosen. One of the first activities of the team was to have a week together courtesy of the New Zealand Sisters, Drumcondra to get to know one another and to discern the area for which each would be responsible and together manage the general area to be covered. This Team and Volunteers and those who followed them over the twenty years have spread the knowledge and the spirit of our Foundress and provided Mercy enrichment and outreach to many. Today, Mercy International Centre conveys a commitment to continue to provide opportunity for growth in the Spirit and Works of Mercy. Marion McCarthy writes: It is with deep gratitude that I look back on the 33 years since Trocaire, the first International Mercy Gathering in Dublin to celebrate the 150th Anniversary of the Foundation of the Congregation. This truly awakened a fresh enthusiasm for Mercy and Catherine worldwide. The sequence of events which followed from Sr. Mary Trainer’s conversation with Sr. Sebastian Cashen in 1987, eventually led to the setting up of the International Steering Committee and the work of restoration of Catherine’s House. The courage and foresight of Mary and the International Congregational Leaders was indeed Spirit led. I was privileged to move into the novitiate wing of Baggot Street on the 1st February 1994 and so experienced the latter stages of the restoration. I was involved in the setting up of the Heritage Display and was present for the arrival of the Archives relating to Catherine and the early days of the Foundation up to 1870. I worked closely with Sr. Mary Trainer and Sr. Magdalena Frisby, RIP, who was the Baggot Street Archivist for many years and was most supportive of the venture. Even though Magdalena felt that we had ‘taken the heart out of her Archives’ in Booterstown, when the documents were transferred she gave generously of her time and shared her fountain of knowledge with us to make it possible to tell our Mercy story. After the official opening of Mercy International Centre, Sr. Magdalena came faithfully every week to offer help, support and advice. Sr. Felicitas Powers RIP, Savannah, Georgia, also worked with us and she was most generous with her archival skills and expertise in the hectic lead up to the opening. The very sensitive selection of Staff took place on the 28th April, 1993 by the Mercy International Association, during a facilitated process of prayer and reflection. Pat, Elizabeth, Ursula, and Josephine and I were chosen to be on the first team. We were excited, full of enthusiasm and aware of our responsibility to the Mercy World. We then spent some time together and in January 1994 we had a week’s initiation with Sr. Mary Trainer. We reflected on the dream for Baggot Street, how the dream was unfolding and how to make this International Centre a wellspring of Mercy. We worked on a process for selecting Volunteers for the Centre and helped plan the Re-dedication/Opening Event. All team Members took up residence in the newly refurbished International Mercy Centre in April/May that year and attempted to set about making our ‘Dream for Baggot Street’ a reality. We grew as a Team, and strove to bring Mercy alive through hospitality, tours, and the sharing of our Archival Treasures with sisters, associates, co-workers and friends who visited. We were enriched by the many Sisters to whom we offered hospitality and who in return encouraged us and shared their own experiences with us. We were also supported in our efforts by the Mercy International Association which was founded in 1992, Members of the Board of Mercy International Association, who held their First meeting in October 1994, and many local sisters, including the New Zealand Sisters, who were always ready to lend a hand. Anne Reid, a Mercy associate of Brooklyn, New York, offered her services after the opening of the Centre and was a generous and dedicated supporter and friend. Anne’s ministry continues to the present day. The Re-dedication/ Opening Event on the 23rd July was a momentous event in our Mercy history but what a steep learning curve! Thank God we were supported by numerous sisters from all over the world who turned in to help wherever they could. Catherine’s spirit permeated the happenings at this most remarkable moment in our Mercy Story. How she must have smiled on the inspiring opening ritual at the Centre, the liturgy at Westland Row and the wonderful celebration meal that followed at UCD Belfield. helped by modern technology which was unavailable at the time of the re-dedication. In my own Mercy story, I can truly say that the time spent on the Team and later on the Board of Mercy International Centre was a grace filled and life-giving experience for which I am truly grateful. In 1994 after 25 years of Education and Pastoral Ministry in Pembrokeshire, Wales I was invited to apply to be part of the international staff and volunteers charged with helping in the development of Baggot Street House as an International Mercy centre; a work which had already been initiated by the International Mercy Association. This Mercy project was under the able management of Sisters Mary Trainer from US and Elizabeth McCaver from New Zealand. When first invited to respond as a volunteer I felt daunted by the prospect, and at the same time very aware of the privilege, of being part of the development of this original and revered House of Mercy into and International Centre. I responded wholeheartedly but with some trepidation to whatever lay ahead and was greatly reassured by the warm welcome which I and other volunteers received. I realised very quickly what lay ahead. It was all hands on deck in the months that followed with rotas prepared by our tireless leaders organising the essential tasks that had to be undertaken. Our first Group meeting took place, not in Baggot St, but in the New Zealand Sisters’ House in Walnut Avenue. I can remember that it was there that Sr Mary Trainer unrolled a long chart of areas of responsibility which needed to be selected by us in accordance with our personal fields of interest. One item on the list was “Responsibility for the Development of the Mercy International Shop”. With a merry eye, Mary turned towards me, and no doubt aware of my business family background….the shop fell to my lot! At that time of course the shop was nonexistent but was earmarked to be sited in a dark niche between two strong walls in the basement. However, Mary saw no problem. Within a week or so the shop was more or less in place. Out from the archives came Sr Mary Clare Augustine Moore’s very beautiful works of art; hitherto unseen treasures from the 1800s. I can recall Mary and Elizabeth joyously poring over them selecting paintings and designs that would be suitable for greeting cards, bookmarks, framed pictures, stationary and many other saleable items of quality. Thus began the Mercy International Shop. Visitors, international and local, continued to call daily, custom grew and grew; and so did the custom of Catherine McAuley’s “Welcome Cup of Tea”. It was a blessed day when Mercy Associate, Anne Reid called. She was quick to see the pressure we were under. At that time and in the coming years she gave invaluable and dedicated support in every way she could in the shop, dining room, kitchen etc. She was soon a fully fledged member of MIC; surely God’s gift to us and no doubt Catherine was smiling. A High Mass of praise and thanksgiving in St Andrew’s Westland Row Church marked the establishment of The Mercy International Centre. The Sisters, Associates, family and friends came in their hundreds. I was touched as the Sisters from various parts of the world entered the church carrying flags of their native countries and placing them around the building. Of course all of this called, later on, for an evening of joyful and well deserved celebration. It is wonderful to see that the Mercy International Centre has gone from strength to strength over the past 20 years maintaining its original character of welcome and hospitality as can be seen from its interesting website page: www.mercyworld.org. Being on the first staff of Mercy International Centre was an experience from which tumble memories of joys, hopes, plans made and unmade, frustrations, hard work, but most of all – memories of gratitude. To be in that sacred place where Catherine lived and where our Mercy story began was a wonderful privilege. When I arrived 3 months before the Opening, “dumpers” were driving in and out of the front door, Works had been delayed and there was so much to be done! and many, many other chores. The International staff – strangers to one another – worked together, using “the talents” they had been given. The leadership skills of Pat Ryan (USA) were put to good use and tested; Elizabeth McCaver (NZ) managed finances and many other things including the bookings for the Dinner when the numbers went up from c. 300 to 700!!! The expertise and delight of Marion McCarthy (GB) in the archives helped to get the Heritage Room set up professionally. Josephine Grey (Ireland) took charge of the shop. Her gracious astuteness and artistic talents were remarkable. I enjoyed welcoming people, showing them around and offering tea and scones. With gratitude I think of the early volunteers without whose help we could not have managed. The warm support of the local Sisters energised us. We lived in cramped conditions upstairs in the “Maguire” wing; the corridor was the office. What joy there was when the builders broke down the dividing wall! As building progressed, rooms had to be furnished. There was an interesting procession from Herbert Street as beds, chairs, cupboards, etc. which had kindly been stored there were brought in. Just before the Opening, we attended the moving ceremony of the Sisters in Ireland becoming one. Another special moment was the arrival of Catherine’s statue. The traffic in Baggot Street was stopped and from the windows upstairs the South American Sisters sang “Catalina McAuley”. “We entrust to you the ministry of caring for this Mercy International Centre. The Mass in St. Andrew’s, Westland Row was a wonderful celebration. It was amazing to see, in the procession, flags from so many countries around the world. Then off to the dinner at UCD. Throughout the whole day there was a joyous spirit of unity – Catherine would have been very pleased.